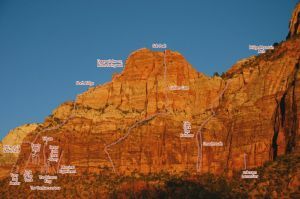 The exact line on the lower portion of the route is unknown. Many options exist in the center of the west face to gain the giant vegetated terrace half way up. From this ledge it’s a walk over to the south to gain the bottom of the chimney. This chimney is a striking, obvious gash in the west face, just right of center of the formation that begins halfway up. Scott Fischer later added a variation that appears to require some serious offwidth climbing. In the back of the chimney, you can ascend the left or right side, the left side being the easier of the two. From the top of the chimney follow cracks up and left to the summit. Descent: Choose your adventure. So far there is no real easy way off this one. Pick one of a handful options. Option #1; Hike overland, using your best orienteering skills to reach Gifford Canyon on the east side of the tunnel (be sure to bring a map). Option #2: Rappel and downclimb the N. ridge. Option #3; Pick one of the first two drainages that bail off to the north and cayoneer your way down it. The drainage that dumps out right above your car at the top switchback has been descended previously but may require some new bolts at old anchor stations. Good luck! Rack: exact rack unknown, offwidth gear recommended. Which SuperTopo guidebooks include a topo for Golden Gate?